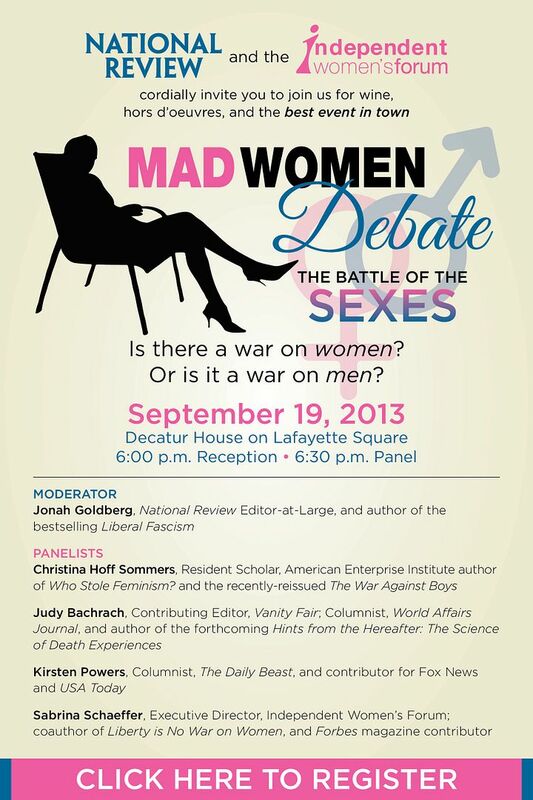 (WASHINGTON, DC) -- On Thursday, September 19th, National Review and the Independent Women's Forum present the long-awaited Mad Women Debate: The Battle of the Sexes. The series debuts with an all-star panel of intrepid women including Kirsten Powers, Christina Hoff Sommers, Judy Bachrach, and Sabrina Schaeffer. Moderator is National Review Editor-at-Large Jonah Goldberg. The debate beings at 6:30pm ET (wine & cheese at 6:00pm ET) at the Decatur House on Lafayette Square in Washington, D.C. With 300 tickets reserved the event will focus on whether there is a war on women or a war on men?